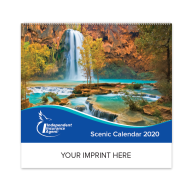 These unique appointment-style calendars were designed in conjunction with IIABA® and Trusted Choice®, exclusively for use by IIABA® and Trusted Choice® members. 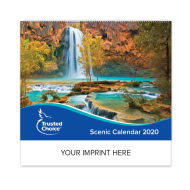 A truly striking calendar that members can distribute with pride, showcasing their association with these respectable entities, as well as their business information. These limited-edition Scenic Calendar features stunning nature photography from locations all across the United States. This unique 12-month appointment-style calendar was designed in conjunction with IIABA, exclusively for use by its members. A truly striking calendar that members can distribute with pride, it's an excellent gift that your clients are sure to appreciate, use and save. Inside back cover is a page where you can write personal "notes to remember"
Inside back cover section on "Why An Independent Agent"
Try these limited-edition wall calendars once and you'll be so pleased, that you will reorder them year after year!